financial meltdown « CONSTABLE RESEARCH B.V.
Haagen-Dazs is warning that a creature as small as a honeybee could become a big problem for the premium ice cream maker’s business. At issue are the disappearing bee colonies in the United States, a situation that continues to mystify scientists and frighten food-makers. That’s because, according to Haagen-Dazs, one-third of the U.S. food supply – including a variety of fruits, vegetables and even nuts – depends on pollination from bees.It is now estimated that nearly half of Italy’s 50 billion bee population died last year. Meanwhile, the situation in the U.S., where up to 70% of honey bees have already died, is far worse than in Italy. The worldwide bee epidemic has also hit France, Germany, Britain, Brazil, Australia, and Canada. Bees are responsible for the pollination of fruits, nuts, vegetables; such as, carrots, cucumbers, broccoli, onions, pumpkins, squash, apples, blueberries, avocados, almonds or cherries. Many animals and insects are dependent on these products. In the end the only thing that is left for us to eat is grain and seafood. The wheat supplies around the world are at their lowest level in thirty years and the demand for seafood is also much bigger than the amount of fish that is produced. The effect is a permanent rise of the prices. At the end only the Rich people (We) are able to buy food. The rest of the World has to find other solutions. Don’t you think this will create a lot of conflicts? Scientists are “mystified” by what they call Colony Collapse Disorder (CCD). Bees use the sky and the earth’s magnetic field to navigate. They communicate this information to their mates by the famous bees’ waggle dance on the honeycomb. Researchers at Landau University in Germany designed a simple experiment. They exposed bee-hives to the radiation of DECT-stations. Of course they also used a control group that was not exposed. For two microwave-exposed hives no bees at all returned. To one hive only six returned. I think it is strange that a simple explanation is not accepted. When bees vanish there can be only one reason. They move out and are unable to find their way back. Because their navigation system depends on “the sky and the earth magnetic field” there must be something wrong with this field. Honeybees are one of the most sensitive indicator species for all the environmental pollution and dangerous technologies we perpetrate. When honeybees disappear, we too, shall follow in due time.I have written more than once about the big changes that are taking place in the Magnetic Field of the Earth. Some changes are caused by external influences (the Sun Cycle) but most of the changes are caused by ourselves. We are polluting the sea, the earth and the sky. Not only the telecommunication-industry is producing electro-magnetic pollution. The Military (US, Russia, China) have produced very powerfull Electro-Magnetic Weapons. This network is build by the US-Army is now covering the US. It produces so called ELF (Extreem Low Frequency) waves. It is proved that these network change the Magnetic Orientation with 10 degrees. ELF networks are also capable of influencing the Emotions. I know that the policy-makers are aware of the problems. They know already for a very long time about the hazards. They don’t know what to do because we are now about a 100% dependent on the “mobile”-infrastructure. They don’t want to admit they told “lies” to the public. It is a well known fact that when many people are compromised they just wait and see and hope for something that will save from a downfall when everybody starts to realize we are moving into a fatal disaster and they knew it all the time (!). Not only the politicians are not acting. The users (Civilians and Soldiers) are also watching and using their beautifull gadgets. They are addicted and don’t realize that electro-magnetic infrastructures are also killing the Immune-system and affect our Emotional States. The Military don’t mind about this. Destructing the Enemy is their Goal. When you read this Blog please realize that You are again informed about a new step in the Destruction of Your own Environment. If we go on this way we will be sick (Auto-Immune Diseases), poor and hungry (Shortage of Food) in due time. We will be poor because the financial system is crashing because of the spectacular amount of financial speculation. Speculation in Commodities is one part of a very big picture that shows that the Financial Industry is gambling on a very large scale. Speculation is one the most important factors for the rise of all the prices in commodities. Sometimes we have to stop something and start all-over again. I am afraid we have to stop mobile communication almost immedeatly and move back to the old way of telecommunication using cables. I am sure we will find low-intensity solutions for Mobile Communication. There is really no need to send Movies and Pictures by the mobile network.There is abundance of Glass Fiber! We also have to stop all the large scale “experiments” with Electro Magnetic Fields that are going on in the Weapon Industry. There is no need for more advanced highly destructive weapons. When I read the news I feel the Worldwide Financial System is slowly moving into the disaster zone. The main reason is the absence of Trust. For almost 25 years I have been active in the Banking Industry. I started my career as a mathematical analyst doing Operations Research. Our most important client was the International Money Market. The next 25 years I was in many roles involved in this area. Banking is in its essence very simple. A bank buys and sells money. All the products of a bank are sometimes very complicated structures where the flow of money (the cash flow) is regulated. A bank has to balance its cash flow every day. When the cash flow is unbalanced it has to buy or sell money from other banks or the National Bank. The money market is the most complicated market. The most important person in this market is called a Dealer. To balance the activities of the Dealers a Manager gives them all kinds of Limits. The sum of all the Limits has to be zero on a daily basis. When they buy and sell money it is very easy to manage the dealers. You just have to add all the cash flows and compare them with the given number.It became much more complicated when the dealers created new products. In these new products they started to trade Expectations (Options). An expectation is a statistical construction. To calculate the Limit a new way of calculation had to be developed. Not only a new way of calculation had to be developed we also needed a new way to keep the books. Everytime when we were able to find a way to solve the problems the dealers invented a new product. They started to trade in expectations of expectations and many other very complicated combinations of other products. In the end we were not able to keep the book anymore. This was the moment when things went totally wrong. Perhaps you remember the end of Barings where a dealer called Nick Leeson was able to fool almost everybody. He wanted to regain his losses and to do this he had to take more risk in every step he was taking. He was gambling with the money of the bank. I don’t want to offend dealers but I think GAMBLING is the best way to describe the current situation in the financial industry. Not only the bank is gambling but also Companies and Customers are gambling in every aspect of their lives. Customers buy a house and hope the price of their house will rise. Companies buy a company and hope the merger will make a profit. Gambling is a zero sum game. Gambling is a very complicated way to distribute a whole. The sum of all the chances is one. To state it simple when one person wins the other has to lose. We created a very complex system that hides the fundamental laws of gambling. An example is inflation. Inflation changes the value of a currency. To compensate the ups and the downs of the currencies money flows from one country to the other. When a bank is unable to reach zero (balance) it has to lend money. There are many arrangements between banks to make this possible. Most of the time banks operate in clusters or networks. They use preferred partners to do so. When you are playing in the lower league you have to pay more. You are playing in the lower league when the chance that you become unbalanced is high. You are a risk and to compensate the risk you have to pay a higher price because the bank has to reserve money to compensate for the risk. The money the bank has to reserve is not making money. A very long time ago I was responsible for a project called Global Limits. We used the GEIS (General Electric)-network to connect all the dealing centers in the world. The system operated on a real-time basis. Every transaction with a bank was stored in the central database. With one button a central manager could block a bank. If the bank was blocked the dealers were unable to deal with this bank. The system was created because of the Oil Crisis. The management of the bank was very afraid the Domino-effect would take place. The Domino-effect happens when a bank goes broke and influences the next one. We calculated this effect on a daily basis. At that time the banking network was not too complicated. Many banks worked in alliances (ABECOR) and the alliances could stop the cascade. At this moment we are in a totally different situation. The banking network is worldwide, highly interconnected and the transactions between banks are based on expectations. When a worldwide expectation fails the system is almost unable to stop the cascade. Most of the time expectations are also balanced. When many expectations fail at the same time the Insurance Industry calls this an Act of God. Acts of God (or Destiny) are outside the reach of statistics. They are so rare that it is impossible to predict them. It looks like the world is hit by many Acts of God at the same time. The System is able to take one blow and a second blow but at a certain point in time the System is down. The money that was reserved to compensate is gone. At that time only Governments are able to help. They are able to create (!!!) money to help the System to survive. Creating money is a temporary solution. In the end the balance has to be restored. The total System gets out of balance when very big or world-wide disasters occur. When the System is unbalanced for a long time the system is permanently vibrating and is basically unpredictable (volatile). The creation of money creates Inflation. There is an end to this Support System when the Inflation rises to an unexceptable level.The only way to solve this problem is to change the value of the Currency or to hide the Inflation. This a trick many countries apply. It buys them some time. The effect is a change of the flow of money from one country to the other country. The most terrible situation arises when the Economy is going down and Inflation is going up (Stagflation). Stagflation is something the brightest economists are unable to handle. You have to stimulate and stop the System at the same time. The current system is still highly dependent on the Dollar. When the US is unable to manage the flows of money the Worldwide System is in big problems. Currently the World Economic Power is the cause of many Acts of God and experiences many Acts of God. Yesterday the former president of the independent financial autority in the US(FED) Alan Greenspan predicted a financial disaster in the US. He explained that the US does not have the financial buffers to handle a crisis. When this crisis comes (the baby-boomers) they have to lend the money elsewhere. What we see now is a very dangerous situation. The banks are afraid to help their colleagues. They don’t trust anybody anymore. When a bank is unbalanced it has to ask the Government for help. When the Bank has to ask the Government for help the customers that have given the bank a loan demand their loans back. The Bank is unable to survive this. When the first bank has fallen the other banks want their money back. When the money is gone the next bank falls and the next bank falls. An endless cascade starts to move like an avalanche. In 1996 Per Bak wrote the book How Nature Works: The Science of Self-Organized Criticality. Self-organized criticality is one of a number of important discoveries made in statistical physics and related fields over the latter half of the 20th century. Per Bak used the metaphorical visualization of a “sandpile” on which new sand grains were being slowly sprinkled to cause”avalanches”. The Domino-effect takes place when the last grain falls and all the sandpiles start to move. What Per Bak discovered was a Power Law. The Acts of God are predictable by a mechanism that underlies the natural phenomenon in question. The Power Law is fractal which means that the rules of the system come back at every level and behave like the tones and overtones of music. Sometimes the disaster is repeated at every level of enfolding of the system and creates a multi-level avalanche. What Per Bak discovered was that the sand-pile system is fractal. It is a self-reference. Old fashioned statistics, used by Banks, are unable to handle fractals.They are not able to predict the “sudden disaster“. “In market terms, a power-law distribution implies that the likelihood of a daily or weekly drop exceeding 20% can be predicted from the frequency of drops exceeding 10%, and that the same ratio applies to a 10% vs. a5% drop. In bell-curve finance, the chance of big drops is vanishingly small and is thus ignored. 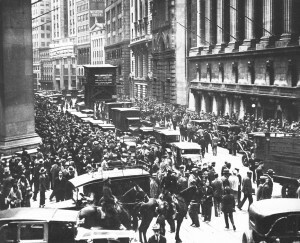 The 1987 stock market crash was, according to such models, something that could happen only once in several billion billion years. Another aspect of the real world tackled by fractal finance is that markets keep the memory of past moves, particularly of volatile days, and act according to such memory. Volatility breeds volatility; it comes in clusters and lumps. This is not an impossibly difficult or obscure framework for understanding markets. In fact, it accords better with intuition and observed reality than the bell-curve finance that still dominates the discourse of both academics and many market players“. What they are telling is that disaster breeds disasters. What they are also telling is that INTUITION is the best tool to use when you want to besuccessful in the financial market. Alan Greenspan explained yesterday what he experienced when he was trying to convince the Government to stop to destroy the Country. He also told the reporter that he was convinced they would not stop the process and he was also convinced the process could not be stopped. I hope he is wrong.